When I moved to Germany (by myself at age 18 to be an au pair to 4 children), I had no idea what an incredible culinary journey I was about to embark on. The most important lesson I learned there was not to waste any food. Leftovers were always used at the end of the week, and turned into some incredibly tasty dishes. The Schwebish family I stayed with grew much of their own food as the father was a professional biodynamic gardener. So wasting food was just not an option. Add to that the tradition and respect that Europeans have for their food, and you end up having no choice but to turn those leftovers into something rather noteworthy. 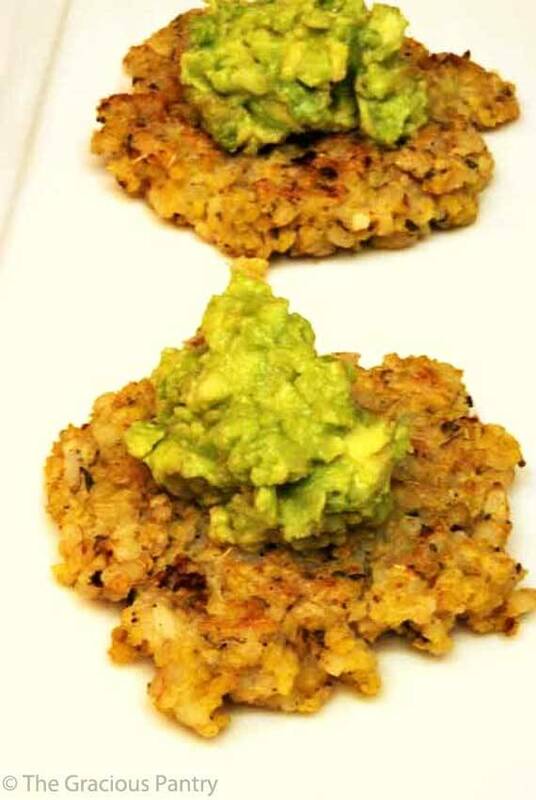 While these little grain patties may not look like much, they pack a huge, flavorful punch! They are simple to make, low-fat if cooked in a non-stick pan, and very, very filling. A little goes a long way. That said, I always make a huge batch because they never last long around my house. If this recipe sounds to big for you, cut it in half. But I wouldn’t go any less than that. Trust me. You’ll eat them. I promise. If you have a larger family, double the recipe. Again… trust me. You’ll eat them. The best part about this recipe is that you can use any leftover grains you have in the house. You don’t have to use what I have here. And on top of that, it can be any combination of grains you happen to have lying around. The more grains you add, the more flavorful the Bratlinge will be. Just keep the proportions the same, and you’ll get a great meal every time! Combine all ingredients in a large mixing bowl. Using your hands, mix well, being sure to mash up any clumps of cold grains (if you’re using leftovers). Form small-ish patties and fry without oil on a non-stick pan. Be sure to flatten them out a bit with a spatula. Remember, the grains are already cooked. You just need the egg to cook. The flatter they are, the quicker they’ll cook. I try to shoot for about 1/4 inch to 1/2 inch in thickness. Also, keep your oven on medium heat. Cooking these on very high heat will burn them before the egg is cooked on the insides. Take your time here. It’s worth it! The Bratlinge are done when they are lightly browned on both sides. Top off with some home made guacamole, and you’ve got a powerhouse of flavor on your plate! (Not to mention, good nutrition.) I love to serve these with roasted vegetables. If you eat meat, add some baked chicken to your plate to round out your meal. If you’re vegetarian, have some beans to form a complete protein with the grains. Please Note: Nutrition data not available for this recipe and will depend on the number of brantlinge made. Yum, these looks delicious and it looks like they’re not hard to make. Since I always am making some yummy grains, sounds like a snap. I’ll have to add it to my meal plan in coming weeks. Thanks for the recipe and great idea! Ever tried this with quinoa? I have not yet tried them with quinoa, but any grains will work in the recipe. It should be very tasty! Please let me know how they turn out for you! these look like latkies without the potato and using grains instead, I will most definitly try these. Trude – Yes!!! How funny, I never noticed that. But yes, very similar in that way. Enjoy!